Helen Seebold is seen pictured with her art, part of Cow Parade NC, named Night-N-Day (aka Nadia). Night-N-Day will be auctioned to benefit UNC Children’s Hospital on February 2nd. The “Battle for the Cattle” tickets are on sale now and the auction will be held at the Raleigh Memorial Auditorium in the Progress Energy Center in Downtown Raleigh. You can purchase your ticket now through a link on the website featured here. Seebold is an established artist in Cary, NC. Her studio, Little Flower Art, holds work that has been shown all over from New York to Connecticut to our own Raleigh, NC. Check out her exhibit 101 Masks at 108 Morris Street in Durham, NC. Living alone is a great source of independence, but it can also come with a lot of work. I have a few tips to help you keep yourself on top of things and make your home for senior-safe. 1. Organize – Have a special place for all your essential items. Know where your list of phone numbers is, your wallet, medical cards, appointment cards and medications. Having a set area for each will help keep you organized so no appointments are missed and all medications are taken on time. 2. Have a Back Up System – This system does not have to be all that complex. Keep back up supplies in your house in case the power goes out or a storm leaves you stuck in-doors or a couple days. Things to always have ready: batteries, candles, matches, flashlights, canned foods, paper products, bottled water and maintain a well stocked freezer. These will give you and your family peace of mind in case anything happens. 3. Connect in your Community – Make it part of your routine to stop by the local senior center. Learn about different events going on and socialize with some new friends. You don’t have to end up spending all day every day there, but it is a great resource for seniors to use. Also, get to know your neighbors. Again, you don’t have to always interact with them or become best friends, but getting used to the daily routines around you can be helpful to you as well. If you ever need some sort of assistance, you know you can call Miss Kelly next door to watch Spot if you are going to get groceries or help carry those groceries in if she sees you struggling. 4. Make your Home Safe – Have a security system in your house that you are comfortable using. Replace mats in the bathroom with ones that have grips or even that extra railing so that both sides of the staircase are covered. Purchase an emergency bracelet and pendent to wear around your wrist and neck. The medical bracelet will help if you get lost or fall in a public place. The pendant can help you alert emergency services if you have fallen in your home and cannot get up. Also, have a system with family if they live nearby. Call them if you are going out and make sure you call back when you return home. This way, if they try to contact you and there is no answer, they will know that you simply stepped out for a carton of milk. Every Saturday, the Cary Senior Center shows a recent blockbuster film for free. The two showings are from 9:30 am until Noon and the other is 1 pm until 3:30 pm. Stick around after the movie to have a discussion with the rest of the group on what you thought about the show. The movie for January is The Hunger Games. The Hunger Games is about a televised event in which children from the different districts must compete against one another until there is only one survivor. 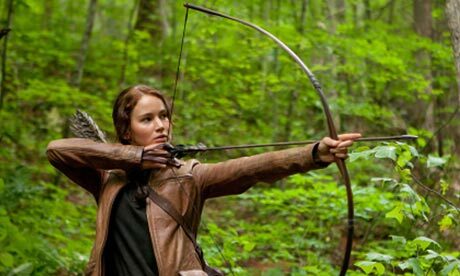 Katniss Everdeen volunteers to go in the place of her younger sister who is chosen to compete. The genre is Action/Adventure/Sci-Fi. PG-13. Don’t let the winter weather get you done, jazz it up! A catered lunch will be provided with a side of toe-tapping jazz tunes. Instead of staying at home, come out to the Cary Senior Center to share in this upbeat experience! Cost for the meal is $15 per person, please make sure you call the center to confirm your reservation. Hope to see you there! Whether you are looking for time to finish a project or to start a new one, join us in classroom 303 at the Cary Senior Center for some knitting! Every Tuesday starting January 22nd through May 14th, we will be meeting up to simply knit and make some friends. Share your creative ideas with one another and help turn that lumpy scarf into the perfect gift for your Granddaughter. If needed, help will be provided. Meetings start at 12:30 pm. Can’t make it every Tuesday? That is perfectly fine, we would love to have you whenever you are available!